No matter how you choose to build your B2B email marketing campaigns, the look and feel of your message are important. To effectively nurture and convert the recipients on your email list, you need tools that give you the freedom to build campaigns exactly the way you want. A drag and drop editor is best for those of us without a background in web design, while an HTML email editor with complete control is best for larger marketing teams that have access to a variety of skillsets. In this post, we’ll cover the basics of using an HTML email editor for powerful B2B email marketing campaigns. How important is the design of your email? Did you know that 59 percent of marketers consider email templates to be one of the most important aspects of an “effective” email campaign? In fact, HubSpot estimates that well-designed email templates can improve potential open rates by anywhere from 10 to 200 percent. Believe it or not, the design and feel of your email campaign can have a big impact on its success. A well-written email message that also looks beautiful can highlight the professionalism of your brand, and leave a lasting impression on your audience. It’s time to get over the “sales blast” style emails of the past because they simply don’t work anymore. Text-based email campaigns may be the most effective way to reach your audience, but even these emails need to be formatted properly. An HTML email editor should give you the ability to set widths and adjust the table of your content blocks. The format of your text including font selection, headings, subheadings, and call-to-action placement all affect your conversion rate. To build an effective outbound email campaign, you must consider the complete user experience that takes place when the email is opened. Your marketing team may have an in-house graphic designer that is capable of producing custom graphics for each campaign. Many of today’s graphics professionals also possess coding skills that translate well when web design duties present themselves. With an HTML email editor, the white space becomes a canvas to create attractive marketing messages. An HTML email editor is also the perfect choice if you wish to copy the code of an existing format found elsewhere. The table structure and formatting can be “borrowed” from another source, and then customized to your own specifications. This can be a clever way to understand what’s happening behind-the-scenes of your favorite templates on the web. Whether your marketing team prefers to edit code from a pre-existing template or create brand new designs from scratch, an HTML email editor gives them the freedom they need to create powerful emails. For those of us who are less graphically inclined or lack web design skills, we’ll discuss an easier option that doesn’t require any coding experience in a moment. The bottom line is, professional marketers deserve complete control over the look and feel of their email campaigns. A robust HTML email editor gives you the freedom and flexibility to effectively generate targeted leads from your B2B marketing campaigns. Be sure to test the responsiveness of the layout when viewed on a mobile device. A design that looks spectacular on a desktop display may lose all of its aesthetics when viewed on a smartphone. Things to watch for are issues with alignment, distracting background images, and overly spaced/jammed items on the screen. A positive user experience is critical when it comes to B2B email marketing campaigns, so take the time to test your layout on multiple devices. If you’ve found a layout you’d like to replicate online, copy the HTML code over to an application like Adobe Dreamweaver, and make your edits. Once you’ve made the edits you want, you can pull the code back into your email editor to make any final tweaks. It’s this level of flexibility that makes having an HTML email editor within your sending software so useful. Because we understand that not everyone feels comfortable editing email templates in an advanced HTML email editor, we created the Easy Message Creator. This tool gives those with no prior experience the tools to build their content using a drag-and-drop style editor. This template builder is easy to use and does not require any special skills such as HTML or web design. In the Easy Message Creator, all you have to do is browse through our pre-built design blocks. Choose the content blocks that you would like to include, and use them to build your own email design template using our drag-and-drop message editor. This tool gives you the freedom to build outbound email marketing campaigns that not only present valuable information to your audience but also look good doing it. The best part is, the Easy Message Creator always builds mobile-friendly layouts. There is no need to modify your designs to look better on a mobile device because each and every template in the Easy Message Creator is mobile optimized. It also scans your message in real-time to alert you of any toxic terms that may prevent your message from reaching the inbox. Now that you know there is a quick and easy way to build an outbound email campaign the way you want, you can start thinking about the type of content you want to share. Here are some of the best ways to get your audience engaged with your email marketing campaigns. 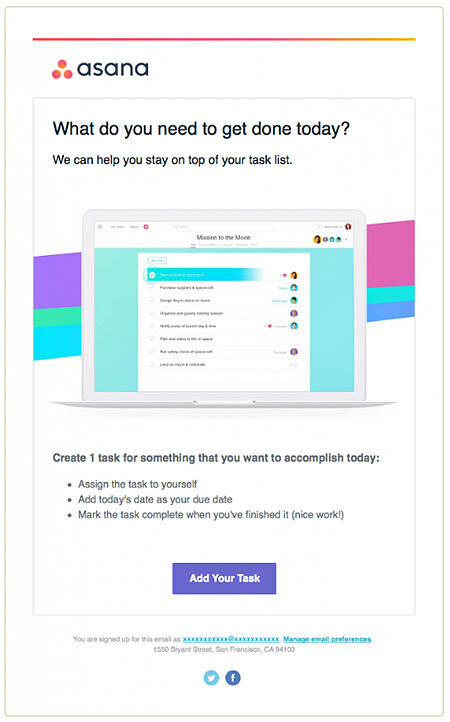 Below is an example email campaign from asana. This type of message shows the reader that getting started with their product is easy and straight-forward. Find more examples of effective B2B email marketing campaigns in this post by Mailbakery.com. To use the drag-and-drop HTML email editor, simply click on My Messages > Easy Message Creator at the top right of the screen. From there, you can start dragging in the design block styles that will best highlight your unique content. 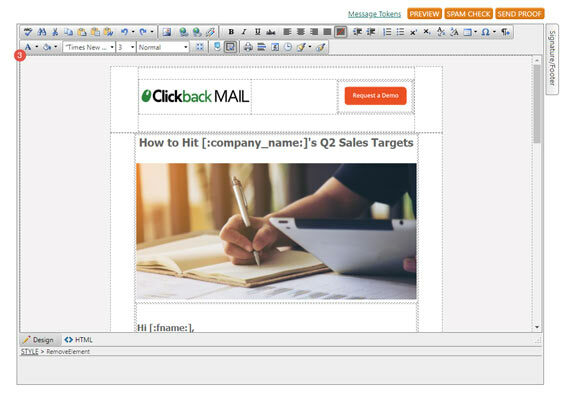 Because Clickback MAIL was built for sending cold campaigns, the Easy Message Creator includes an advanced real-time spam checker that alerts you when flagged words and terms are used. This way, you can make the necessary tweaks to your content that can have a dramatic effect on the deliverability of your campaign. From here, you can also send yourself a proof of the email to get a feel for what your prospects will see. The live preview button will also display the formatted content on the right-hand side of the screen in real time, so there are no surprises once you have completed building out your design. You can choose to view your message in a large format, on desktop, or mobile. Our drag-and-drop HTML email editor will provide you with a number of benefits. Save time and money — With our Easy Message Creator, you can build everything yourself in a matter of seconds, no matter your experience level. It’s that quick and easy, whether you’re a complete novice or an old pro. So you’ll not only save time, but you’ll save money, too, because you won’t have to pay a designer to build your templates for you. Make changes on the fly — If you make a mistake during the design-build process, you can easily modify your chosen content and images in real-time using our drag-and-drop HTML email editor. You don’t even have to touch the code. Generate more leads — By using our editor to build email templates, you can improve the effectiveness of your email campaigns. You can highlight important content, add more visually appealing design elements, and create a stronger CTA — all of which will lead to a greater click-through and conversion rate. Improve campaign performance — Use A/B testing to really get the most out of the email templates you design with our drag-and-drop HTML email editor. See which elements of your design aren’t working and adjust your strategy accordingly. This post was originally shared on October 21, 2016, and updated on May 10, 2018.